The National Hockey League's 2012-13 season will face off with four games on Oct. 11, followed one night later by the Los Angeles Kings raising the first Stanley Cup championship banner in the franchise's 45-year history. Opening night will feature nationally televised doubleheaders in both the United States and Canada. In the U.S., NBC Sports Network will air the 2011 Stanley Cup champion Boston Bruins visiting the Philadelphia Flyers, followed by the St. Louis Blues at the Colorado Avalanche. In Canada, CBC will televise the Montreal Canadiens playing host to the Ottawa Senators, followed by the Calgary Flames hosting the Vancouver Canucks. The NBC Sports Network will also televise the Kings' game against the New York Rangers on Oct. 12 as L.A. celebrates the championship it won earlier this month by beating the New Jersey Devils in the Stanley Cup Final. The Devils and Kings meet just once this season -- Feb. 9 at New Jersey. The Detroit Red Wings and Toronto Maple Leafs will have Jan. 1 all to themselves when they face off in front of a potential record-setting crowd in the 2013 Bridgestone NHL Winter Classic on New Year's Day at Michigan Stadium on the campus of the University of Michigan. The game, the only one scheduled for the first day of the new year, will be televised live on NBC in the United States and on CBC and RDS in Canada. 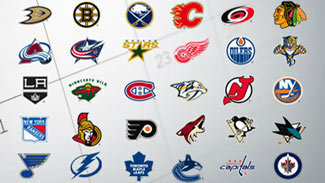 The League’s 1,230-game schedule will pause from Jan. 24-28, 2013, for the NHL All-Star Weekend in Columbus. Then it's a race to the wire until the final day of the regular season -- Saturday April 13 -- when 28 teams of the 30 teams will be in action. Under the NHL scheduling format, each team plays six games against each team in its division (24 games), four games against the non-division teams within its conference (40 games) plus 18 non-conference games -- including at least one game against each club in the other conference (15 games) and three other games against select teams.